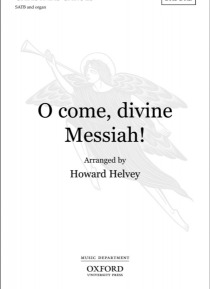 IHG® Rewards Club - eBook - O come, divine Messiah! for SATB and organThis French carol scored in 6/8 is set by Howard Helvey with a rhythmic, animated, and cheerful organ part that gives the traditional tune a lift. The choral parts are straightforward, the choir singing in unison initially and later in four parts with a key change from G major to B-flat major. This arrangement is geared towards the average church choir and would be a fresh additi… on to any Christmas service.